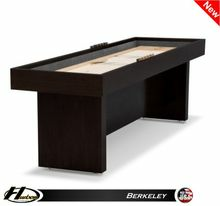 GET A GREAT DEAL ON THESE DEMO HUDSON SHUFFLEBOARDS BEFORE THEY'RE GONE - PRICES INCLUDE FREE CURBSIDE SHIPPING! With the exception of the GRAND DELUXE HYBRID model (which is brand new and made to order) these demo boards are in excellent shape and have been used at either trade shows, tournaments, charity events, or as floor models. All boards include free curbside shipping, one set of playing weights, one board wipe, two bottles of speed wax, and one can of silicone spray. Demo tables are crated and shipped within 7-10 business days unless otherwise noted. Installation is also available. Pricing and availability on demo shuffleboards subject to change. If applicable, additional sale pricing does not apply to items in outlet store. Discount price shown below each item is the final sale price. 9' Deluxe Hybrid - NEW with Custom Stain Options! 12' Deluxe Hybrid - NEW with Custom Stain Options! 14' Deluxe Hybrid - NEW with Custom Stain Options! 16' Deluxe Hybrid - NEW with Custom Stain Options! 18' Deluxe Hybrid - NEW with Custom Stain Options! 20' Deluxe Hybrid - NEW with Custom Stain Options! 22' Deluxe Hybrid (tournament size) - NEW with Custom Stain Options!